Lyttle – (née McCabe) 13th April 2019, peacefully in Lisnisky Care Home, late of Seagoe Park, Portadown. Joan Elizabeth, dearest mother of Paul and Joanne, mother in law of Anja and Jon, a much loved Grandma of Jody, Astrid, Zanne and Sophie and Great Grandma of Willow and Jack. Family and friends will be made welcome at Milne’s Funeral Home, 59 Seagoe Road, Portadown, BT63 5HS on Monday between 10am-12noon 2pm-4pm and 5pm-7pm. Funeral Service, Tuesday at 2pm in First Portadown Presbyterian Church with committal following in Seagoe Cemetery. 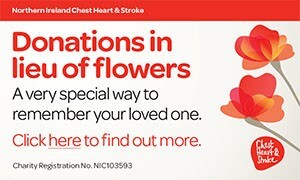 Family flowers only please, donations in lieu of flowers if desired to The Donkey Sanctuary, Devon c/o Milne Funeral Services, address as above. I am sorry to tell you that Joan Elizabeth LYTTLE has passed away.